ARTICULATION: The clarity with which you speak. To speak with proper articulation is to speak clearly, pronouncing letters and words properly so the audience can understand you. BLOCKING: An actor's movement and stage positions during a performance. CHARACTER: A person, creature, or entity in a story or play with specific and distinguishing attributes. CHARACTERIZATION: The process of creating a believable character by exploring the character's physical, social, and psychological aspects of the role. CHEAT OUT: When an actor turns his body to face downstage in order to be more open to the audience, even if it wouldn't be natural for him to do so in another context. CROSS: An actor's movement from one part of the stage to another. EMOTIONAL MEMORY/RECALL: An acting technique in which the actor calls upon his own past experiences to use the emotion felt in those times and transfer them to his character. MOTIVATION: What drives a character (and the actor portraying him) to act. One stereotype of actors has them asking "But what's my motivation?" OBJECTIVE: A character's goal. The reason a character does and says what he does and says. PANTOMIME: Telling a story or creating a character using movement, gestures, and facial expressions without talking. POSTURE: The way an actor stands, sits, and generally holds himself. Posture can do a lot to physically create a character. 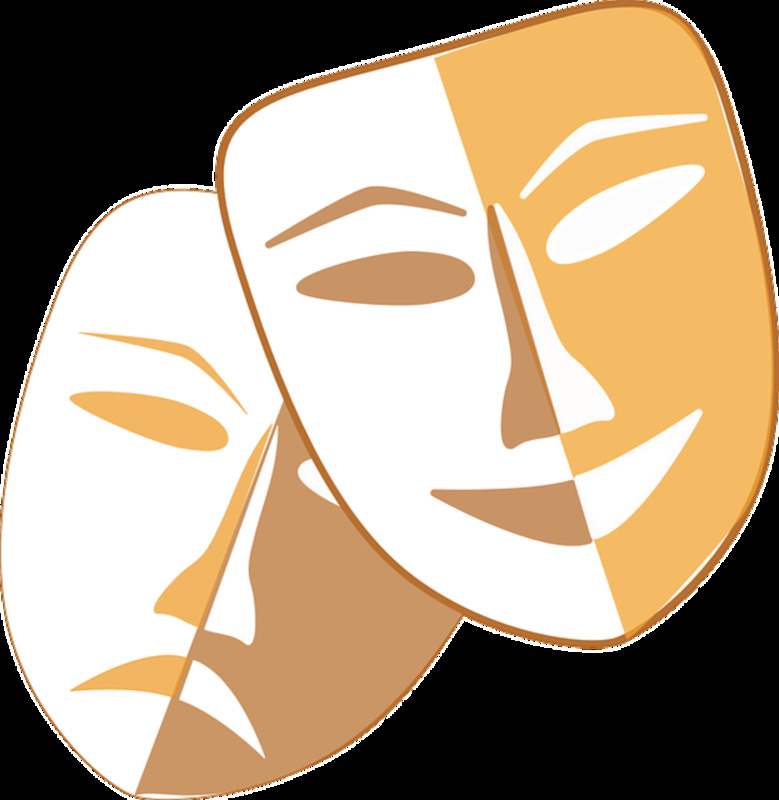 AUDITION: A competitive try-out for a role in a play. A chance for actors to show directors their capabilities in hope of being cast. CALL: The time one is expected to be present and ready for a rehearsal or performance. CALLBACK: A second audition; directors will bring back certain individuals from a first audition to consider them further. COLD READING: A reading of the script done without looking at or studying that script in advance. Sometimes used at auditions. CRITIQUE: Feedback given over what was done well and and what was done wrong in a performance or rehearsal. DRESS REHEARSALS: The final rehearsals done for a show; these rehearsals are done in full costume and make-up. OFF BOOK: Another word for memorized. A rehearsal off book will be one in which the actors do not use scripts. PLACES: The positions for all actors and crew at the beginning of a play. REHEARSAL: A practice for a play. RUN-THROUGH: A type of rehearsal that goes through the entire play, or a full act, as opposed to specific moments or characterizations. ANTAGONIST: A character who acts in opposition to the main character, or protagonist. Often the 'bad guy' of the play. COMEDY: A humorous play. Traditionally, comedies ended in marriage, which implied birth and new life, as opposed to a tragedy, which ended in death. CONFLICT: A situation that arises when the objectives of two or more characters or forces are at odds. Good plays and stories are built on conflict. DIALOGUE: Written conversation between two or more characters. DRAMATIC STRUCTURE: The structure of a play. This form was established based on classic Greek and Roman theatre; not all modern stories fit into this structure. EXPOSITION:This establishes the setting and characters of the play. INITIAL/INCITING INCIDENT:The moment that introduces the primary conflict of the story. RISING ACTION:The build in the action between the inciting incident and the climax. Most modern plays are made primarily of rising action. CLIMAX: The moment of highest tension in a play. The moment in a play when the protagonist makes a decision that makes the end of the story inevitable. 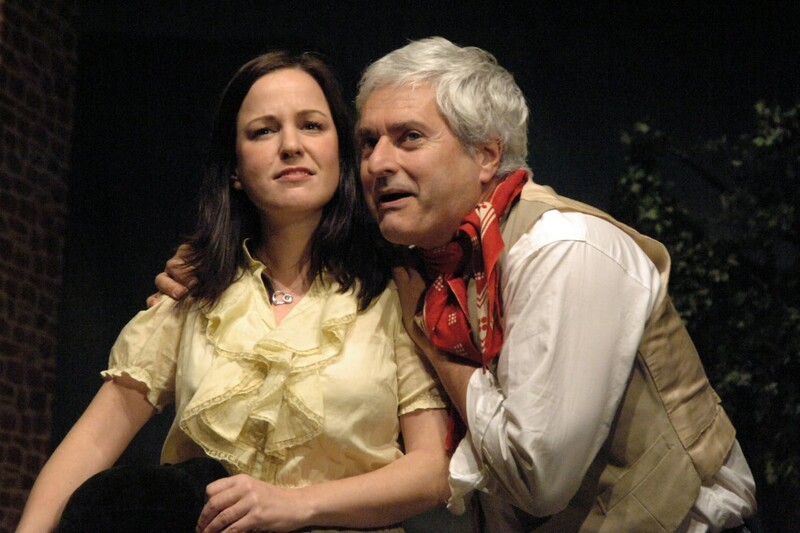 FALLING ACTION:The part of the play which follows the climax. In modern stories, the falling action is frequently quite brief. DENOUMENT: The end of the play, when conflicts are resolved and the ultimate fates of characters are revealed. Generally, comedies leave their protagonists in better situations than the ones they started in, while protagonists in tragedies are usually worse off. FARCE: A type of comedy that seeks to entertain its audiences through a series of extravagant and improbable situations. GENRE: The style of the play. Genre can be as broad as 'comedy' or 'tragedy' or as narrow and specific as 'courtroom drama' or 'burlesque'. MELODRAMA: A style of theatre primarily popular in the 18th and 19th centuries. Characterized by exaggerated plotting and characters, 'melodramatic' has come to mean an over-the-top style. MONOLOGUE: A speech given by one character to other characters. 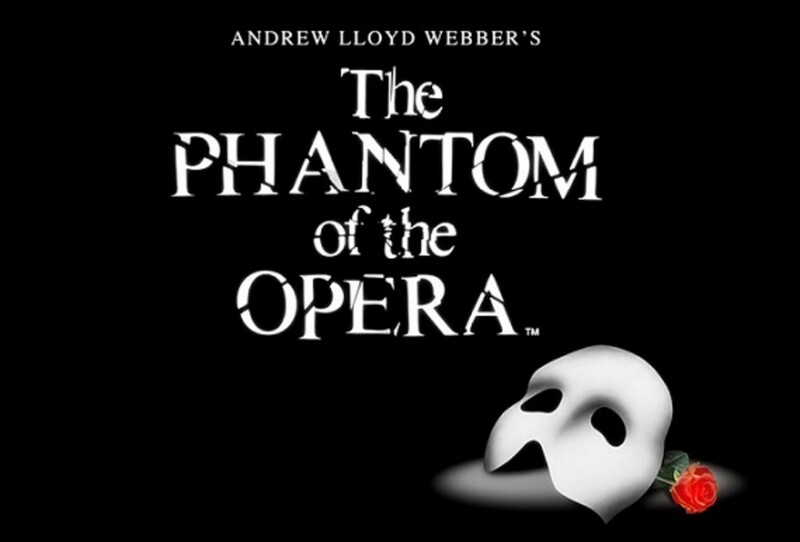 Monologues are frequently used as audition pieces. 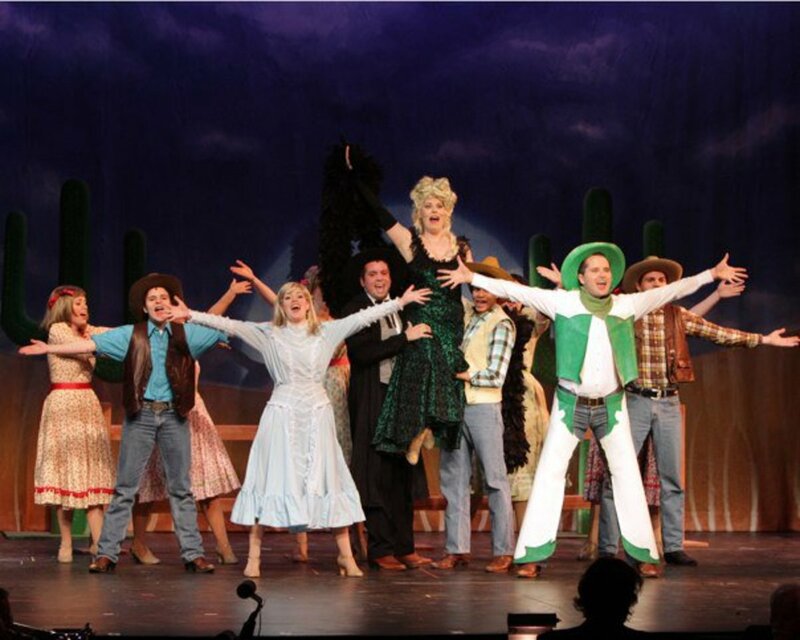 MUSICAL: A play using musical accompaniment and sung music to tell its story. PLOT: The events of a play, from its beginning to end. PROTAGONIST: The primary character in a play. Often considered the "good guy." SATIRE: A story or play which uses humor to make strong statements about individuals, policies, or society as a whole. SCRIPT: A printed copy of the dialogue and instructions of a play. SOLILOQUY: A speech given by a single character to himself to express his thoughts for the benefit of the audience, as opposed to a monologue given for the benefit of other characters. SUBTEXT: The underlying emotion, thoughts, and meanings underneath what is said by the characters in a play. TEXT: The words said aloud by characters during a play. THEME: A unifying concept in a play. TRAGEDY: An unhappy, emotional play. Traditionally, tragedies ended in the death of the protagonist, as opposed to a tragedy, which ended in marriage and implied birth and new life. CUE: In technical terms, the trigger (be it a line or an event) for an action to be carried out at a specific time. Lighting and sound cues are called for by the stage manager, following along in the script with the events of the show. LIGHTING: The deliberate use of light to illuminate the stage or convey a location or emotion, and sometimes all three. 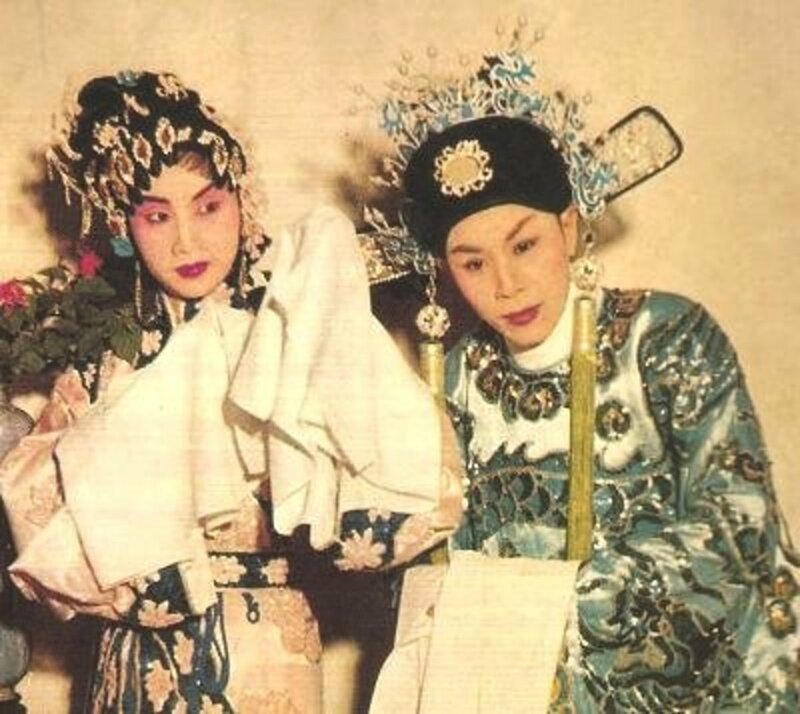 MAKE-UP: The use of cosmetics to create the appearance of the character during the play. MASKS: A face covering used in theatre to create character or disguise identity. PROPS/PROPERTIES: The objects actors interact with onstage. Items such as books, plates, and swords are props. PUPPETRY: A form of theatre using puppets in its storytelling. Some shows are done entirely with puppets, while other shows use puppets to enhance its story, interacting directly or indirectly with actors. STRIKE: At the end of the run of a show, when the set and all other technical aspects are taken apart, clearing the stage for the next show. DESIGNER: The person or persons responsible for devising and creating one technical aspect of the show, be it the lighting, sound, costume, make-up, props, or some other aspect. PLAYWRIGHT: The person who writes the plays. STAGE CREW: The people behind the scenes who keep the play running. They can change scenery, control the elements that fly on and off the stage, help prepare actors with quick changes, and generally make the play happen. CENTER / CENTER STAGE: (A) The center position of the stage. Generally considered the most 'powerful' position on the stage. DOWNSTAGE: (B) The section of stage nearest to the audience. UPSTAGE: (C) The section of stage furthest from the audience. 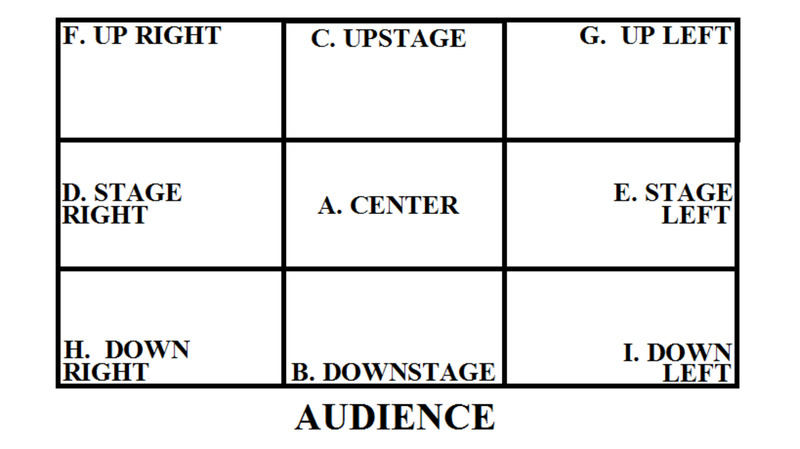 STAGE RIGHT: (D) The section of stage to the actor's right as he faces the audience. STAGE LEFT: (E) The section of stage to the left of an actor as he faces the audience. UP RIGHT: (F) The back right section of the stage, when facing the audience. UP LEFT: (G) The back left section of the stage, when facing the audience. Generally considered the 'weakest' position on stage as it is the last place the audience is likely to look. DOWN RIGHT: (H) The front right of the stage, when facing the audience. After center stage, this is generally considered the second-most powerful section of the stage as it's the first place audiences trained to read from left-to-right usually look. DOWN LEFT: (I) The front left of the stage, when facing the audience. Double check your definition of TRAGEDY--you'll find "tragedy" when what is meant is "comedy"--not THAT'S tragic, I mean, funny! What a great list. So many terms we may have heard but may not know the meanings of. Theater vocabulary has evolved as it's own language over the 'centuries'. Thanks for the information.